The flu shot has been getting both positive and negative press in recent years. There are many medical experts that feel the flu shot is protecting people from dangerous bouts of the flu. But maybe even more importantly, these experts say, the flu shot is helping to prevent another epidemic. Because the flu is contagious, the more people who are vaccinated against the flu, the better. It only takes one person with the flu to spread this virus to another person, who in turn might pass the flu on to someone else. Those against the flu shot cite its potential adverse effects. The flu shot has caused a number of reactions in people ranging from mild problems to those that are more severe. 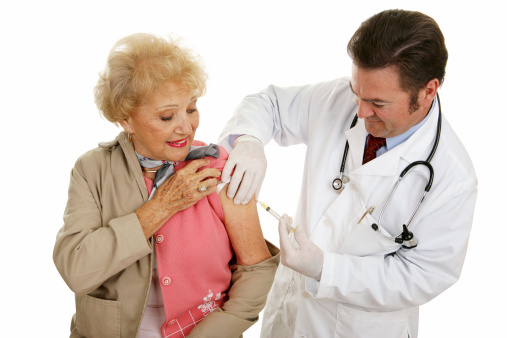 Usually reactions to a flu shot will show up within two weeks of getting the injection. The Centers for Disease Control and Prevention have confirmed that headaches and respiratory tract infections may show up in one out of every three people that get the adenovirus flu shot, for example. A stuffy nose, joint pain, and/or a sore throat could appear in one out of every six people and abdominal pain, cough, and nausea in about one out of every seven. As for more serious side effects of the adenovirus flu shot, one out of every 100 may experience a fever, develop pneumonia and experience inflammation of the stomach or intestines. Despite these adverse reactions, the CDC says hundreds of millions of Americans have safely received the flu shot. As winter approaches yet again, and you’re contemplating whether or not you will get a flu shot, here’s some positive press about getting vaccinated. It seems that getting the flu shot may help those with a history of heart disease reduce their risk for a heart attack or stroke. The study was published in the Journal of the American Medical Association. The researchers were able to show that people who had acute coronary syndrome or were experiencing unstable angina had almost a 40% lower risk of having another major heart event within a year of receiving a flu shot. For those who had recently suffered a heart attack, that number rose to 55%. That means that these people in a high risk group cut their risk of having a major heart event by half just because they had a flu shot. The researchers found these startling results after reviewing six clinical trials involving some aspect of heart health but that also involved participants who had had a flu shot. Over 6,700 patients qualified for the trial. Most were in their late 60s. Here’s another way to look at the numbers from the study. For the heart patients that didn’t get a flu shot, nearly five percent had a major heart event such as a heart attack or stroke within one year. For the heart patients who did get a flu shot, only three percent suffered a major heart event. Taken in this context, the flu vaccine could be seen as an affordable, safe and well-tolerated therapy for preventing heart attacks and other cardiovascular events in those at high risk. Commisso, C., “Flu shot halves risk of heart attack stroke for heart disease patients,” CTV News web site, Oct. 22, 2013; http://www.ctvnews.ca/health/flu-shot-halves-risk-of-heart-attack-stroke-for-heart-disease-patients-study-1.1508409, last accessed Nov. 6, 2013. Wijayasinghe, S., “Know these five flu shot myths before you think about turning it down,” The Globe and Mail web site, Oct. 22, 2013; http://www.theglobeandmail.com/life/health-and-fitness/ask-a-health-expert/know-these-five-flu-shot-myths-before-you-turn-it-down/article14960914/, last accessed Nov. 5, 2013.